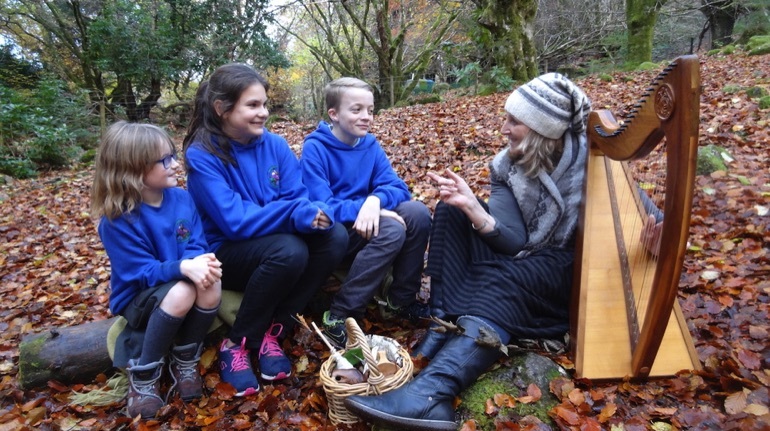 Schools in the Highlands are working with conservation charity Trees for Life to learn firsthand about native woodlands and rewilding through a new project that combines tree planting with storytelling, folklore, history, geography, poetry and song. A round 300 pupils in Cannich, Balnain, Drumnadrochit, Fort Augustus and Invergarry are taking part in the Rewilding the Highlands project, which is supported by the Heritage Lottery Fund. “This is an exciting collaboration in which teachers and pupils are working together to discover more about our precious native woodlands and the importance of restoring Scotland's ancient Caledonian Forest,” said Alan Watson Featherstone, Trees for Life's Founder. Specially commissioned teaching resources written by Sallie Harkness and Carol Omand of Storyline Scotland – including stories, songs and puppets – are bringing the project alive for the schoolchildren. The pupils are also learning about past relationships between people and trees, Gaelic place-names, and the craft of the storyteller or seanachaidh. Storyteller, singer and harpist Claire Hewitt recently visited Invergarry Primary School to share woodland folklore, songs and stories, while training upper primary pupils as apprentice storytellers. Gaelic storyteller Ariel Killick also visited Invergarry Primary School and Kilchuimen Primary School in Fort Augustus, using her engaging workshop 'Adventures with the Gaelic Tree Alphabet' to explore environmental issues, Gaelic poetry and language, and the Highland clearances. The project addresses a wide range of curriculum areas including outdoor learning, science, Gaelic, arts and literacy. Participating schools have visited Trees for Life's acclaimed Dundreggan Conservation Estate in Glenmoriston to find out more about conservation and to help in the charity's tree nursery. Plans for the schools also include community celebrations of the project, and walks in community woodlands with pupils who are to be trained as nature guides. Next spring, poets Alec Finlay and Ken Cockburn will work with secondary schools on a Gaelic place-name map, using linguistic archaeology to reveal lost woods and wildlife in Glen Affric, Glen Urquhart, Glenmoriston and Glen Garry. Pupils will carry out research, with their discoveries added to the map. The Caledonian Forest has been an important part of the Highlands' culture and natural landscape for millennia, but is now one of the UK's most endangered habitats – largely because of over-grazing, which prevents natural regeneration of its trees. For details about Trees for Life's award-winning work to save the forest, visit www.treesforlife.org.uk.